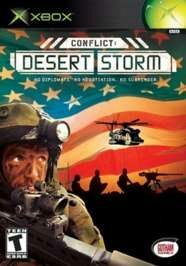 This game is based around actual Gulf War history. I, not being a scholar of modern history, cannot confirm if the details are accurate, but from what I have seen from news broadcastings on the first Gulf War I can say that the general history of the conflict is definitely there. The in-game story follows a group of four American or British special-ops as they attempt to sway the war in the favour of their nation. Don\'t worry about selecting the British or Americans at the beginning of the game, as nothing different happens as a result of your choice. The game is a third-person shooter, following four different people. Each member of the group has a different skill and specializes with different weapons. This comes in handy while fighting the Iraqis, and good team management is necessary if you hope to defeat the towelheads. Of course, one person controlling four characters can be tough, and so a built in control system allows for you to order your men to attack, defend, or to walk at a quicker pace. By placing your men to attack, and moving them into some prime real-estate you can eliminate many of the evil-doers and keep your men alive. Learning, and using all these skills effectively, is imperative to a successful mission. The graphics in this game are below par. The sand textures are all off, and an US M1 Sherman tank is a darker shade of green than portrayed in the game. Footprints are never left, even though 80% of the game takes place on sand. The explosions look harmless which can teach children poor grenade use. The background music through out the game is a bit repeative, but does a decent job at setting the scene and atmosphere. The developers also made up for their short-comings in the graphic department by adding some realism in your opponents character through sound. Not only do they speak in tongues, they also cry out Allah\'s name when they are shot. One completion of this game is more than enough. You could always repeat the game as the opposite nation of your original choice (American to British, British to American) but that wouldn\'t accomplish much as it would just be the exact same game again. There is no competitive multi-player mode to keep interest in this game, and so it will most likely die out faster than your troops after you are flanked by some ambushing forces. While they did not include blood, they did decide to go with realistic physic reactions to blunt objects. So if your solider is hit by a rock thrown by a defenseless Iraqi child, you will actually see your soldier\'s body shape deform as if the bones were broken. This game is also violent in that they did not code a system where shooting women and children would deduct points. Instead you get your regular point values, and so it actually rewards you on killing the innocent. In a training mode, a drill officer used some foul language. During the sniping drills, my character was told something amongst the lines of \'You\'re 5\'10? I didn\'t know we stacked **** that high.\' While the foul comments are few and far between, they are present and inappropriate. I consider Violence and Language to be adult content. I awarded 4 points to this category because there was no apparent sexual imagery anywhere in the game. There is no evidence of the occult in this game. While the game on the surface happens to be a enjoyable experience, the underlying values taught to children can be harmful. There is some objectionable material present in this game, and some of it is necessary to capture the horrors of war. However, if the developer is aiming for a realistic portrayal of a war they should assign a higher rating for their game. I do not believe this game is safe for children, but can be enjoyed by mature audiences.